As the end of life.turns. is come and gone we can safely say that the quick development and release circle for that feature didn’t do too much harm. Now these features have to be removed as the project is at it’s end. Together with some small layout changes and some requests this makes for version 1.4! 2. 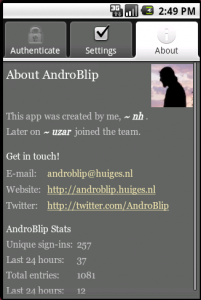 Download from the Website (apk): Androblip 1.4 (free). As the options and upload were specifically for the life.turns. project that has ended, the clutter has been reduced by removing the files and menu option for it. A reasonable request, and easy enough to do: long-press on an entry shows you the EXIF information, just as you would see when you click the link a bit lower on the same page. The first second comment in the market (by ‘Andrew’) requested this quite quickly and it has been requested by mail too. We’ve made this a setting, because it can be a real pain when you have a bad data connection. It starts ‘off’ by default, and you can find it in the preferences. We also changed the ‘loading’ behaviour a bit, so to have a better reponse on slow loading systems. If you’re checking out the preferences, also check out the new layout of the about page, where we now list some new application statistics. We’ve added the new resource ‘statistics’ on the about page as you can see below. After about 4 or 5 distinct attempts it worked, but it still doesn’t help solve the original problem of the length of time it takes for blipfoto to respond to an upload request using a slow data connection. @wife: jeej :D. Was that the shot of the woman with the Red hair? Ow wait, I can just click your journal-link ofcourse…. ah, check! @ upload bug: The biggest problem is that the feedback you are getting isn’t exactly correct. I’ve been meaning to “pull an Apple” and change that feedback. The upload-measurement is too quick, I don’t think it’s correct, so it might be some sort of timeout. A bit of a problem yesterday with the date format, suddenly it would not upload to Blip saying the date format was wrong (which doesn’t seem to be the case), both myself and wife experienced this. Is it an Androblip or Blipfoto problem. @Ian : I’ll have quick look, but it seems that I can verify this happens. I don’t know yet if this is a Blipfoto or an AndroBlip problem, but I’ll have a look ASAP! It is the same again tonight. I am sure that you have thought of all of this already but I was wondering whether it is simply going from the 9th to the 10th month that is the problem, used my proper camera on the 1st so it would not have shown up then. The bug was something else, but months that had only 1 digit where treated differently, and coincidentally escaped the bug like this. I’ll test the fix and if it looks like nothing is broken you’ll get a release soon. Excellent, thanks for all your responses they are much appreciated!